Jitterbug has created a cell phone initially marketed to senior citizens, or people who don’t have a lot of experience with technology. In fact, an article in BusinessWeek dubbed the Jitterbug “a cell phone for baby boomers.” But it’s also becoming a popular option for kids. The sleek and simple phone was designed by Jitterbug and is manufactured by Samsung. It’s a little bigger than most phones today, which makes it easy to handle and use. There are two models—one with the typical keypad, and the OneTouch, which has only three buttons: one for dialing 911, one for dialing a Jitterbug operator, and another that can be programmed with a number by a parent or caregiver. All functions are completed by answering with a simple “yes” or “no” on the keypad—no confusing menus to deal with. A variety of accessories, such as headsets and a charger that automatically updates phone data, is also available. There’s also a “Simple Text” function with preprogrammed messages (such as “I’ll be home soon”) that can be sent at the touch of a button. As with most kids’ cell phones, parents (or caregivers) can control the Jitterbug remotely on the Web, including the ability to disable features they don’t want. There are no contracts, only monthly plans that run $15 to $80. Minutes can be added on easily, anywhere from 15 cents to a quarter per minute. 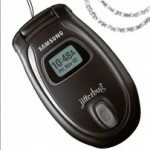 The Jitterbug is a real phone, so kids and tweens will appreciate that, and it comes in two colors, graphite and white. The phone doesn’t include the usual bells and whistles, but Jitterbug fonder Arlene Harris is considering adding features such as a camera. Update, May 26, 2009: Samsung, the maker of Jitterbug, has issued a recall of all Jitterbug phones (Jitterbug Dial and Jitterbug OneTouch) sold between March 1, 2008 and this date, due to some of the phones proving unable to reliably connect to the 911 emergency line when traveling (“roaming”) outside of the service’s calling area. The phone otherwise works fine, but a repair is recommended. Await a letter and prepaid envelope to return the phone to Samsung, which should give it back, fixed, in about a week. You can also reach Samsung at 866-304-4980 and see more information from the U.S. Consumer Product Safety Commission on the Jitterbug Recall.